Star Wars: Age of Republic: Qui-Gon Jinn #1 review: A detailed study of a pivotal yet unexplored character – AiPT! A great character study of one of the most revered Jedis in history. Despite only appearing in one film, Qui-Gon Jinn is a monumental character in the Star Wars universe. After all, without his insistence, Anakin Skywalker never receives any Jedi training and likely dies in a podracing accident or is sold off-world by Watto for being an annoying dweeb (I don’t like Anakin, if you can’t tell). Even serving such a pivotal role in the ultimate rise and fall of Anakin Skywalker/Darth Vader, Qui-Gon is a relatively unexplored character…until this week’s Star Wars: Age of Republic- Qui-Gon Jinn #1. Kicking off the Age of Republic line, Star Wars: Age of Republic- Qui-Gon Jinn #1 tells a brand new Qui-Gon Jinn story that truly exemplifies what made the character so resonant in just one film-appearance, even if the plot is bare and adds little to Star Wars canon on a whole. From the opening panel to the final page, one thing is abundantly clear: writer Jody Houser gets Qui-Gon Jinn. The transition from screen to comic is effortless and Houser truly makes it impossible not to hear Liam Neeson’s soothing voice whenever reading through Qui-Gon’s dialogue. He never says or does anything out of character, and he even delivers grade-A wisdom here that makes up for his cliche “there’s always a bigger fish” line in The Phantom Menace. What is perhaps most enjoyable about this story is how it dives so much deeper into the core of Qui-Gon, deeper than fans have ever been. In The Phantom Menace, it’s clear that Qui-Gon is one of the more independent-thinking of the Jedi, but this issue shows that it comes from a sense of wonder, betterment, and thirst for knowledge not a misguided sense of rebellion. Here we see Qui-Gon unrelentingly challenge what it means to be a Jedi and seek a deeper understanding of the force in a way that elevates his already legendary standing. The resulting physical and metaphysical journey is one that leaves Qui-Gon changed, with a more firm grasp on his knowledge of the force and the understated importance of balance. Those looking for an action-packed story loaded with massive revelations around the character will be disappointed, as this story is solely-focused on Qui-Gon’s thirst for knowledge and understanding. Truth be told, this issue offers nothing substantial to the Star Wars universe as a whole and that is a bit of a let down. Not every issue of every Star Wars comic is going to pack some major, undiscovered detail about a character, but a character as sparsely used as Qui-Gon deserves more finite, big reveals in his one-shot. The in-depth character analysis is great, but I can’t help but feel this issue is missing a much needed “wow” moment. The art from Cory Smith, Walden Wong, and Java Tartaglia really shines in the latter half of the book, as Qui-Gon is brought to a mysterious planet by the force. The first glimpse at the planet’s surface is mesmerizing, particularly because of the bright, contrasting colors from Tartaglia against the intricate plant life brought to live by Smith and Wong. The art does an incredible job carrying the story through a collection of dialogue-less pages, really exemplifying the theological quandaries Qui-Gon grapples with throughout this issue. The lack of dialogue and dark-side-infused entranced state of these scenes are reminiscent of Luke’s experience in the caves of Dagobah, a welcome moment for long time fans. 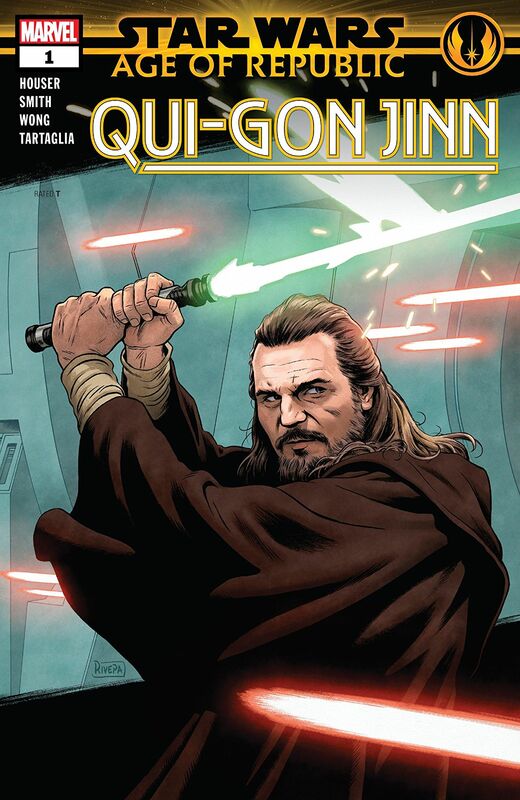 Even if it lacks any big revelations about Qui-Gon’s character or past, Star Wars Age of Republic: Qui-Gon Jinn #1is a fantastic character study that provides an in-depth look into the machinations of one of the most legendary Jedis. Readers will walk a way with a newfound understanding and admiration for Qui-Gon Jinn, even if they’re a bit let down by the lack of any big moments or reveals. It may not pack a big punch, but Star Wars Age of Republic: Qui-Gon Jinn #1 provides the most intricate analysis of the legendary Jedi yet that will leave readers with a new understanding and admiration for the character. Jody Houser GETS Qui-Gon Jinn, as she effortlessly brings him from screen to comic. This book exemplifies why Qui-Gon is one of the most admirable Jedis in the entire saga, really focusing on his inquisitive, questioning nature. The art wonderfully carries the book for the majority of its second half, bursting with vibrant colors and expertly visually the story's themes. Unfortunately there's no big revelation or "wow" moment anywhere in this book- readers may leave with a better understanding of Qui-Gon, but nothing truly new is revealed about him.